The Canon X07 was very popular. The RAM could be extended thanks to small cards (which looked like credit cards), although these cards were very expensive. ROM cards were also available for professional applications. 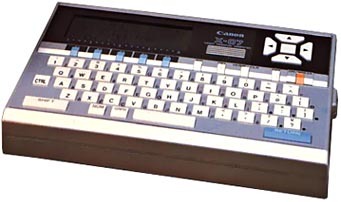 The Canon X07 had a video interface and uses a cathodic screen. Thanks to this interface, the X07 could use a new text mode, 40 x 24, and a new graphic mode, 256 x 192, with 6 colours. It is unknown if the two displays could be used simultaneously. An infrared interface was also available to allow the connection of peripherals without the use of cables. see more Canon X-07 Ebay auctions !